VpCI-322 oil-based concentrate adds corrosion protection to lubricating or hydraulic oils. VpCI-322 provides excellent protection in indoor or open air conditions. First, oil-soluble corrosion inhibitors offer a tenacious film which clings to metal surfaces, giving excellent contact corrosion protection. In addition to this film barrier, VpCI-322 releases vapor phase corrosion inhibitors into the air above the oil. These VpCIs attach to metal surfaces for additional corrosion protection. Add VpCI-322 to oil at a ratio of 1 part VpCI-322 to 9 parts oil for 24 months protection. Tanks, gearboxes, differentials - stored or shipped dry: Fog cavity interior with VpCI-322 concentrate using 1 quart (1 liter) per 35 ft³ (1.1 m³) of enclosed space. Available in 5 gallon pails (Cortec Product # 12100597) or 55 gallon metal drums (Cortec Product # 12100598). 5 gallon drum weighs 50 pounds and ships under our standard shipping rates. The 55 gallon drum must be shipped by truck. We will provide you with a freight quote before we ship this product. The product should be sealed before storage. 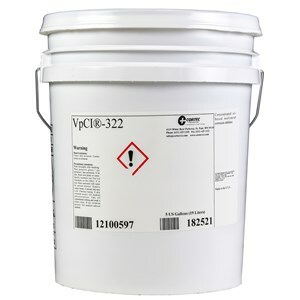 VpCI-322 has a shelf life of up to 24 months. Quantity Discounts Available for Large Orders. Please call for more information.